This character appears the same as the regular issue KOOKY ZOO ELEPHANT. They were made for a German water park and spa. This one looks really cool I like the colors. 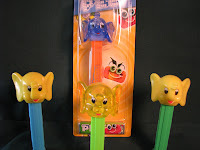 With the 12 days of Christmas as well as Christmas day it has been a pretty good PEZ HAUL(iday).